These four titles are synonymous for what is essentially finding the properties of the formation that affect how fluid flows through the ground, whether it is a gas reservoir, an aquifer or the rock around an excavation. Sigra conducts such testing for the petroleum, mining, civil and groundwater industries. The process involves causing flow to occur and finding out the pressure changes that are associated with that flow. The test methods involve pumping from or injecting into a well and measuring the pressure change in that well, or in surrounding monitoring wells during the flow and recovery periods. Because of the varying depths and fluids, the test processes may differ but the fundamentals remain the same. The nomenclature used in different disciplines varies. Petroleum engineers work in centipoise for viscosity and milli-darcies for permeability. Groundwater Engineers will mix the two with density and create a unit known as permeability or more correctly, hydraulic conductivity. In-situ permeability testing is undertaken to obtain a measure of the permeability in the ground. It invariably involves measuring flow from or into a well. In addition it involves the measurement of pressure. This is normally conducted within the test well, but may also be undertaken in observation wells. Is the geometry of the formation being tested known? This covers all the different types of boundary such as faulting, thinning or recharge. It also covers the adjacent formations—Are they sealing, gas caps, aquifers or fluctuating phreatic surfaces? Without knowledge of geometry the analysis of the well test may be completely erroneous. Frequently however, the results of well testing help provide the clue to the geometry of the reservoir. How many phases (gas, water, oil) exist in the reservoir being tested? The uniqueness of solution of a multi-phase test is always in doubt. It is far better to test with the predominant phase. For coals in their original state this usually means water, as most coals are normally water saturated until the pressure has been lowered and gas is desorbed. Most coals exhibit significant directional permeability. How does the permeability vary during production or drainage? Coals generally show a very pronounced relationship between the effective stress and the permeability. It is possible for coals to change their permeability by an order of magnitude if the pressure within the seam is lowered by a few Mega Pascals. What is occurring near the test well bore? The behaviour of the formation near the well bore is generally different from that of the rest of the reservoir. Drilling fluid invasion changing the viscosity of the fluid adjacent to the well. Particulate matter entering the pore space or cleating adjacent to the well and changing its permeability. Effective stress changes near the well bore changing the permeability of the formation. This applies particularly to the case of coal. Loosening of the formation adjacent to the well bore leading to enhanced permeability near the well. This case applies particularly to gravels and sands which loosen as they relax on to a screen. Non-linear flow effects near the well bore. In higher permeability reservoirs it is possible to have high enough flow rates that the flow adjacent to the well bore becomes turbulent. Phase variation near a well bore. In the case of coals it is possible to lower the pressure for a long enough period that gas is desorbed from the coal. Because of the multi-phase effects the gas may partially block the movement of water towards the well bore. Well bore storage may be important in well tests where the flow rate into the well is small compared with the well volume. This is the case for liquids where the well loses and gains fluid volume with changing liquid level, or in the case of gas wells because of the change in stored volume with different pressures within the well. The radius of investigation of a well test matters as it is important to know how representative a volume of formation is being tested. If the volume is too small the result of a test may simply represent the mud damaged or stressed zone around the well. If it is large then it gives confidence to the result. The higher the permeability and the longer the test then the larger the zone influenced. Sigra uses the concept of the mean effective radius of investigation to characterise the zone tested. Well test analysis enables the determination of permeability, reservoir pressure, the degree of near well bore permeability damage and the radius of investigation. This is most easily achieved by testing a well with a single flow rate followed by a build-up period during which no flow takes place. If the test is prolonged, its overall pressure reduction (draw down) may be observed and some estimate made of the reservoir size. Where observation wells can be used additional information may be gained on the storage behaviour and directional permeability of the reservoir. Being able to de-convolute a complex multi-rate test is theoretically possible if the reservoir properties remain absolutely constant and the geometry of the reservoir is known. It is however in most real cases an undesirable complication. This applies particularly to the case where the near well bore pressures vary widely, with the flow rates causing changes in effective stress and permeability in the near well bore area. If additional information is sought on near well bore effects, it is best to conduct a single rate test with recovery followed by an independent step rate test. In any measurement it is necessary to keep practicalities in mind. The first is in maintaining the simplicity of any test procedure. The second is in ensuring that the test produces results that can be analysed. Sigra carries out testing to measure permeability and reservoir pressure in formations such as coal seams to determine their in-situ conditions. The tests are typically undertaken in HQ size (96 mm) exploration holes but may be undertaken in larger holes too. The most successful testing involves drawing fluid from the formation to be tested rather than injecting. The reason for this is that the testing is being undertaken using the reservoir fluids of known viscosity and temperature. Injection testing can be performed but frequently leads to sharply increasing well bore losses during the test as clays in the drilling fluid tend to plug cleats near the well bore. The form of testing most frequently undertaken is a drill stem test. This involves emptying part of the fluid from the drill string, sealing the test zone, waiting for pressure stabilization and then opening a valve between the test zone and the drill string to induce flow. After a period of inflow the valve is closed to induce pressure build up. This procedure may in some cases be repeated to confirm behaviour. The extreme range of characteristics of coal seam reservoirs prevents the use of an identical test for each seam. It is essential to be able to monitor at surface the formation response to the test process and to adapt testing to meet in-hole behaviour. 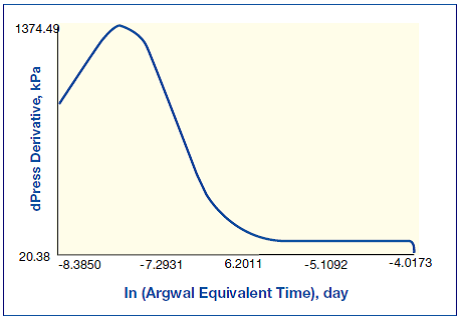 Sigra surface readouts permit viewing of the well test progress in numerical or graphical form. Typically the plots produced are of the total test, the derivative plot with respect to Agarwal time, and the Horner build up plot. Having the ability to view these plots in real time ensures that all tests that Sigra controls and undertakes with its own equipment produce a valid result, provided that the packers can be seated on a sealing formation. 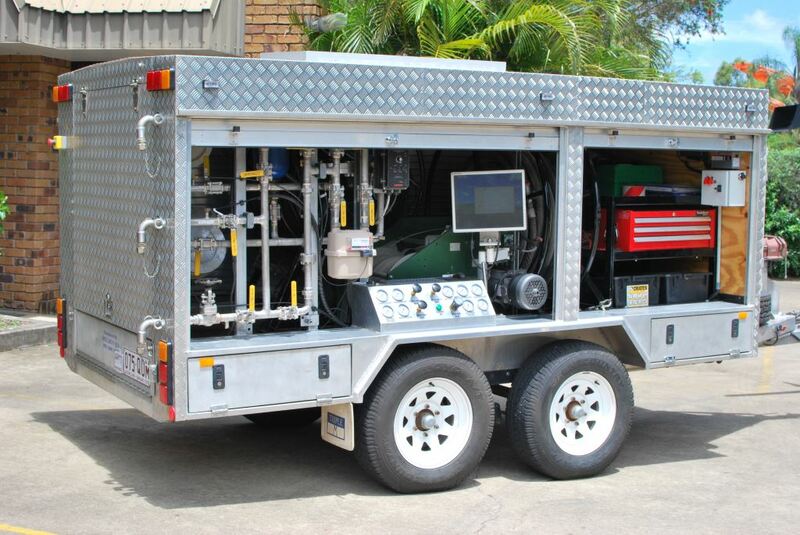 The DST system developed by Sigra comprises a trailer containing data logging equipment, control equipment, and down hole tools. The down hole tools are in two forms. The first tool is designed to be run through the HQ or HRQ drill string on the drill rig’s wire line. It may be run as a straddle or bottom test tool, depending on whether a bottom packer and extension rods are used. Therefore it can be run to depth and be used without pulling the drill string. It may be used in holes up to 105 mm diameter. The advantage of this tool is that it may be run quickly without pulling the drill string and therefore tests may be conducted with unstable sections of borehole above the test zone. The second tool is an end of string tool and may also be used in straddle or bottom test configuration. It utilizes a bottom assembly that is designed to be screwed on to the bottom of the drill string. Packer inflation and communication lines are lowered down inside the drill pipe on the drill rig’s wire line to connect with the tool. The tool can be used to test multiple times without pulling the drill string, provided that the test zone straddle spacing remains the same. Both tools use either compressed air or nitrogen to push down the fluid in the drill string prior to a test. Each system contains a zero volume change valve that controls connection between the test zone and the inside of the drill string that is operated by raising or lowering the string once the packers are set. Pressure transducers monitor pressure in the test zone, above the valve in the drill string, and packer pressure.Packer inflation is from either a water pump at surface or in shallower holes by compressed air. The communication and inflation lines are taped to the drill rig’s wire line for raising and lowering. At the top of the drill string is a snubber to shut in around the cables should a blow out occur during running of the tool or cables. Above this is a sealing head which seals around the cables during operation. The surface equipment contains a regulator to control the pressure of air from a compressor that is used to push the water level down in the drill string. It also contains high and low flow gas meters to measure the flow rate of gas from the drill string. In addition it contains a water regulation system to permit water injection into the string at a controlled pressure or rate should that be required. When the through the bit tool is used then the drill string is set at the correct level and the tool is lowered through the seal, snubber and string to protrude through the bottom of the core barrel. If the end of drill string tool is used then the tool is attached to the bottom of the string and the string lowered to position. Regulated air pressure is used to displace water from the drill string. A pressure is used that will not blow air out of the bottom of the string into the hole. The packers are set and the drill string is then lowered to close the valve and the compressed air is bled off. The valve may then be opened to induce flow from the test section into the string. The water inflow can be monitored by a change in head on the in-string pressure transducer whilst the flow of displaced air and any gas produced can be measured on the gas flow meters. Any gas flow can be detected as the difference between water inflow to the string and gas flow out of the string. Following the test procedure the drill string is filled, the pressures inside and outside the tool are equalized, the packers are deflated and the top seal around the cable and inflation line is opened. The through the bit tool may then be withdrawn through the string or the case of the end of string tool the electronics module may be pulled. In each case blowout control is afforded during this operation by the snubber. Permeability tests take as long as the reservoir demands to provide a solution. Failure to take tests to completion leads to their being unanalysable. In high permeability cases the tests may be completed in a few hours. In medium to low permeability cases the recovery part of the test is frequently conducted overnight. In very low permeability reservoirs the tests may need to be run over two days. 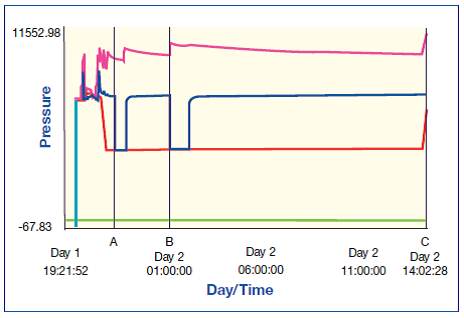 It is not normal practice to conduct DST tests for longer than this. The basic analysis of results is based on the inflow rate and the slope of the Horner build up plot when this has stabilised. The stabilisation is defined by a constant value of the plot of the derivative of pressure with respect to Agarwal time versus Agarwaltime. Analysis is generally on the basis of a single phase which may generally be a liquid (water) but may also be gas. Analysis of mixed phase flows can also be undertaken in terms of the permeability for each individual phase. In addition to the permeability, the reservoir pressure is assessed and the well bore loss terms described. The well bore loss terms are evaluated in terms of skin and effective well bore radius. The mean effective radius of investigation is also calculated. 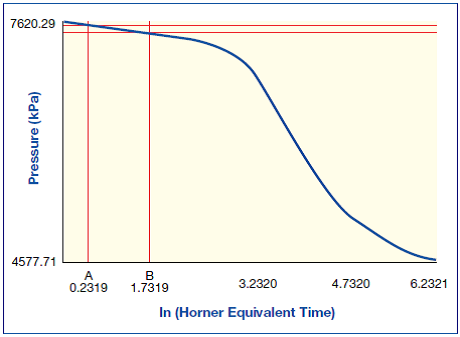 It is based on the actual times of the points used in determining the slope of the Horner plot and represents the mean radius at which the pressure changes between these times may be considered to act. Sigra may at times conduct more detailed analysis of early shut in behaviour to determine effective stress – permeability characteristics of the formation – in particular coals. The DST equipment is conveyed to site in a trailer or in a pod. This houses the electronics, reels, pumps and flowmeters required for an operation. A snubber is also carried to shut in the test string in the event of packer failure. The pods are suitable for a helicopter lift. Sigra conducts two types of injection – fall off tests. Both utilise Sigra’s drill stem test tools to inject rather than to produce. The basic procedure is the same in either case. Namely the DST tool is run to isolate the test zone and set. The formation pressure is then allowed to come to near equilibrium. This is followed by a flow period, which in this case involves flow into the formation, followed by a recovery period. The first test type involves using either the drill rig pump or the DST trailer mounted piston pump to inject fluid into the string. The trailer mounted pump will deliver up to 6 litres per minute beyond which the rig pump is used through a control system that will deliver either constant pressure or controlled flow rate injection. The usual mode of operation is that injection is carried out for a period and then the test zone is shut in to allow pressure to decay. The second test type is typically used when the formation pressure is too low to produce a useful DST (inflow test). In this case the drill string is filled with water and when equilibrium is reached the valve is opened to permit flow from the drill string into the formation. After a period of inflow the valve is closed to permit recovery. The volume of fluid that has flowed is measured by the change in head within the drill pipe. The analysis process is identical to that used for drill stem tests except that inflow rather than outflow is taking place. While the system may appear to have advantages, particularly in avoiding the desorption of gas from coals, it has been found to have practical complications. The most serious of these is due to well bore damage associated with injection. This comes from two sources. The first is the presence of small clay particles in the injection fluid. These may have come in the water that is brought to site or from the well bore itself. The second is associated with the injection of a fluid that is not the formation fluid, thus causing a disassociation of the clays in the formation which blocks its fractures or cleats. The other problem that has to be overcome is that of being sure of the viscosity of the fluid being injected, as it may be contaminated with drilling fluids. If any injection test is to be used it must be carried out with a fluid that is as close to the reservoir fluid as possible. In the case of coal seam methane wells this preferably means produced water. This then has to be deflocculated and carted to site in clean containers. The well must then be flushed with this fluid to remove any drilling mud. This is preferably done whilst rotating and reciprocating the drill string so as to break up any filter cake. Then the test may be performed using this fluid for injection. However,our practical experience is that in all but the most permeable coals, problems are generally experienced with gradually increasing well bore damage throughout the test. Interference testing is a process of injecting or withdrawing reservoir fluid, usually from a single well, while monitoring the effects on fluid pressure in surrounding wells. It is particularly useful in determining the directional nature of permeability. In this case at least three monitoring wells are theoretically required to determine the full directional nature of permeability. In its simplest form, interference testing involves drilling a central injection or production hole surrounded by three monitoring wells, set at an appropriate distance away. Ideally there should be more than three observation wells to provide some redundancy of measurement and to help avoid inhomogeneity being confused with anisotropy. These should also not be located diametrically opposite each other. The central well can be set up for production with a pump or injection. In the latter case the well would normally have a packer, or packer system, lowered into it on the end of tubing. The monitoring wells are fitted with pressure transducers either set between packers or cemented in place. It is important that the transducers are checked for connectivity to the formation before the test commences. Injection into or production from the central well then takes place until a clear pressure response is seen in the observation wells. Recovery is permitted to follow. Analytical techniques permit the directional permeability and compressibility or storage behaviour of the reservoir to be determined. Where gas caps exist production is the only sensible option. Interference techniques may also be applied to production wells. In this case the testing is usually run over a longer period to yield the effects of permeability change due to dewatering and shrinkage of coals. Here, the process required to arrive at the reservoir behaviour is usually one of history matching. Sigra can undertake interference tests, either in isolation or as part of a production monitoring programme. Sigra has all the requisite capabilities of reservoir monitoring and injection equipment hardware. It also has the analytical skills to interpret the results. Pulsed well testing offers an alternative way to determine reservoir properties over a significant area. The benefits that it offers are well to well measurements of transmissibility x thickness and storage terms without having to wait for the definition of a characteristic type curve. Rather the lag and amplitude of pulses related to production from or injection into a well are measured. This has the advantage that it may be applied to a field from which other steady production is occurring. The technique is also useful in that it can be used as an alternative to interference testing as it provides a well to well, directional value of transmissibility. It is particularly useful when used in multiple hole tests. In the figure it can be seen that if well P1 is tested alone it yields a value of mean transmissibility. If well P1 is then fitted with a pressure transducer and well P2 is tested then it yields a value of mean transmissibility at that location and a value with directional component between wells P2 and P1. This process can be continued through wells 3 to 5 by leaving a pressure transducer in the previous well and producing or injecting in the well just drilled. Doing this provides a statistically relevant sample of five measurements of mean permeability and ten directional measurements as is shown in the table. While this is fewer than the total number of permutations that could be tested, it is one where the pressure transducers do not need to be removed until the test process is complete. It thus leaves a five spot pilot test pattern with fairly well known (usually single phase) properties before production commences. In situations where the principal directions of permeability may be estimated from structural information or stress directions, it is possible to calculate the major and minor permeabilities. Testing wells will yield two measurements of mean transmissibility and one of directional transmissibility. The mean transmissibility is theoretically the square root of the product of the major and minor. Therefore if the mean permeability is known and one principal value is also known then it is possible to calculate the other principal value of transmissibility. Pulse testing requires very sensitive pressure sensing in the observation wells and negligible well bore storage. Sigra has the pressure sensing technology to achieve this. For normal well spacing it is only suitable for high transmissibility reservoirs but can be used for quite low transmissibilities if the wells are drilled at close spacing. 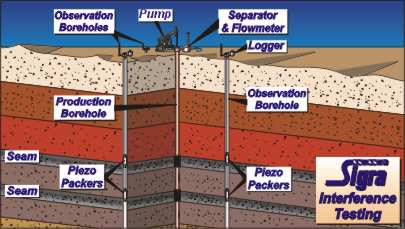 Underground tests to determine permeability and pressure are generally conducted for water in all mines, or gas in coal mines. Being underground provides a great opportunity to understand the geology and in particular the structural features that control permeability. In the case of coal the ability exists to map the seam in great detail. The salient features are the coal bedding, including potential sealing bands and most importantly the cleating. The cleats are the sub vertical fractures within the coal seam. The cleat spacing defines the distance over which diffusion must take place before Darcy flow in the cleats can take place. The nature of the cleats themselves is also most important – do they have infill of clays or carbonates? Such infill can seal a seam very effectively. The hardness variation of the coal is also important as the coal’s mechanical properties will strongly affect how the coal seam responds to changes in effective stress brought about by drainage. Such changes are caused by a lowering of fluid pressure and the shrinkage of the coal as it gives up gas and dries. Coals are very inhomogeneous and the flow measured from a borehole usually is not released evenly over its length. The flow depends on many factors such as the coal ply in which the hole is drilled, cleat direction and intensity, stresses within the coal, direction of the hole and major jointing within the seam. It is therefore desirable to measure the flow coming not only from a borehole but from each section of a borehole. The process shown in Figure 1 can be used to determine the flow at various locations along shorter holes. Here a single packer is pushed to the back of the hole and then inflated, before the flow is measured. The packer is then deflated and moved out by an incremental length, which is typically one drill rod, before being re-inflated and the flow measured again. The flow per unit length is therefore the difference between measurements, or the slope of the flow versus distance curve. This process may be repeated over the length of the hole to get a complete flow profile. In longer holes this approach cannot be used because the change in flow over a useful change in measurement distance is small compared to the total test section flow. 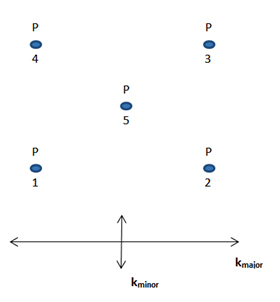 The system shown in Figure 2 is therefore used. In this system, straddle packers are inflated to isolate a section of hole and measure its flow. The flow from the hole behind is bypassed past the packer system. The quickest experimental method to determine the permeability of gassy coal seams is to use the system shown in Figure 3. Here a hole is drilled and a single packer is inserted beyond the rib side zone and used to seal the hole, with all flow coming down the test tubing, which is connected to the packer. The flow of water and gas is measured over a period and then the valve on the tubing is closed and the pressure build-up is monitored. It is usual to repeat this for a second flow and build up period. The test technique can be conducted in holes of several orientations so as to determine the directional characteristics of permeability. If the flow is just water semi-analytical techniques can be used. If however a coal seam is being tested the exact nature of the permeability must be approximately determined by history matching, using a simulator, because of the complex behaviour of coal seams. Because of the variations in permeability throughout production, and the need to maintain a check on material balance, it is very useful to conduct longer term drainage tests. The essence of these is to compare the gas produced from the seam with the change in seam pressure, using the latter to arrive at a gas content through the sorption isotherm. Thus the material balance equation may be applied. The Gas in Place is determined by pressure sensing and the use of the sorption isotherm. The Gas initially in Place is either measured directly, or via pressure. The Gas Drained is obtained by flow measurement. The Other Sources are gas gained or lost through the ribside or entering the seam from the roof and floor, frequently via major joints. The ideal embodiment of the test layout is shown in Figure 3. Here a central hole is drilled and fitted with pressure sensing points, either through the use of a multiple packer assembly (Figure 4), or by grouting the hole with either pressure sensors or sensing lines (Figure 5). Two flanking drain holes are then drilled on either side of the pressure sensing hole and the flow from these is measured. An example of the correlation between the gas content derived from seam pressure measurement with sorption isotherm, and the content derived from the material balance calculation is shown in Figure 6. This example shows a very good match, which indicates that an understanding of the coal seam drainage characteristic has been achieved. The bulk permeability of the coal may be determined through history matching. Note that not all cases show such a good match and in these cases the Other Sources term needs to be investigated.